Welcome to my Mercy Ship Adventure. Please feel free to read about my journey and post a comment! If you have your own web page you can post my Wave of Mercy Sprout on your page too! Just click the share button in the bottom right corner of my sprout. Thanks so much. This is a picture of me and the Third Mate, Joe that I met in the airport in Brussels. He is here for 3 1/2 weeks and will return to Texas to work on an oil rig in the Gulf of Mexico. Pray for the people of Benin, West Africa. Mercy Ship's next stop in 2009. 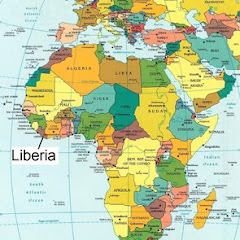 Pray for the people of Liberia: Healing, Hope, Jesus-filled lives. Pray that God uses my experiences to mobilize others for His Kingdom work. that God would be preparing my heart/mind/body to serve...that I would make the time to meet with God daily. Too many answered prayers to list them all! God is loving, faithful, and kind. Thanking God for a wonderful experience at Southfield Christian Schools. God allowed me to be an example of His Love. God brought healing for my Liberian patients and friend: phsycial, emotional, and spiritual healing. God protected me during my travels, spiritually, physically, and emotionally. God multiplied my time and my organizational skills to get everything done that I needed to do before I left. My financial needs were met. karaoke night was successful: it was fun and a powerful witness to who God is, the community that He has created. Ok, so I am new at posting pictures!! !